Computer animation made its debut in criminal court on Monday as jurors watched a technically precise video showing how Nicole Rae Walker, 6, was struck and killed by a pickup truck. 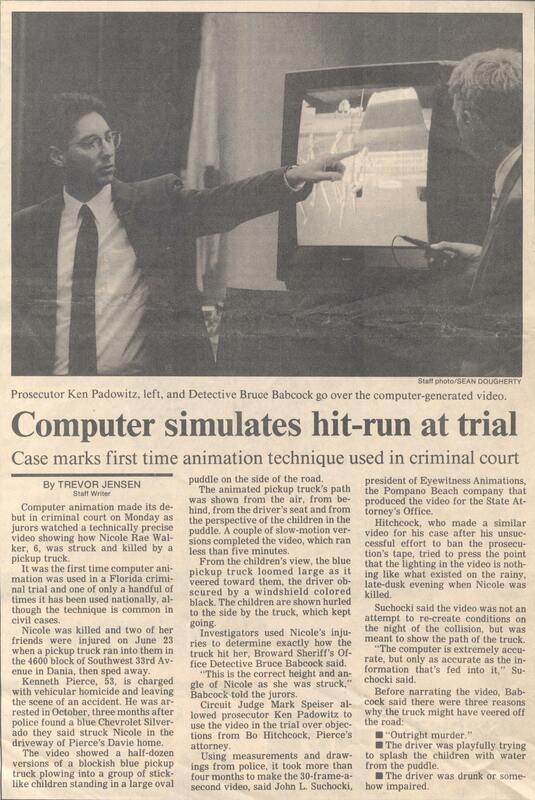 It was the first time computer animation was used in a Florida criminal trial and one of only a handful of times it has been used nationally, although the technique is common in civil cases. Nicole was killed and two of her friends were injured on June 23 when a pickup truck ran into them in the 4600 block of Southwest 33rd Avenue in Dania, then sped away. Kenneth Pierce, 53, is charged with vehicular homicide and leaving the scene of an accident. He was arrested in October, three months after police found a blue Chevrolet Silverado they said struck Nicole in the driveway of Pierce`s Davie home. standing in a large oval puddle on the side of the road. The animated pickup truck`s path was shown from the air, from behind, from the driver`s seat and from the perspective of the children in the puddle. A couple of slow-motion versions completed the video, which ran less than five minutes. From the children`s view, the blue pickup truck loomed large as it veered toward them, the driver obscured by a windshield colored black. The children are shown hurled to the side by the truck, which kept going. Investigators used Nicole`s injuries to determine exactly how the truck hit her, Broward Sheriff`s Office Detective Bruce Babcock said. “This is the correct height and angle of Nicole as she was struck,“ Babcock told the jurors. Circuit Judge Mark Speiser allowed prosecutor Ken Padowitz to use the video in the trial over objections from Bo Hitchcock, Pierce`s attorney. Using measurements and drawings from police, it took more than four months to make the 30-frame-a-second video, said John L. Suchocki, president of Eyewitness Animations, the Pompano Beach company that produced the video for the State Attorney`s Office. Hitchcock, who made a similar video for his case after his unsuccessful effort to ban the prosecution`s tape, tried to press the point that the lighting in the video is nothing like what existed on the rainy, late-dusk evening when Nicole was killed. Suchocki said the video was not an attempt to re-create conditions on the night of the collision, but was meant to show the path of the truck. “The computer is extremely accurate, but only as accurate as the information that`s fed into it,“ Suchocki said. –The driver was playfully trying to splash the children with water from the puddle. –The driver was drunk or somehow impaired. Read Story in the Sun Sentinel HERE.